This US 352 sign should be a VA 352 sign. 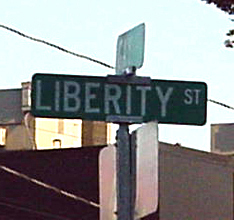 It's located in St. Charles, Va., just a few miles from US 421. The photo at left was taken in winter 1998; the one at right in summer 2000. 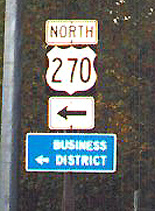 This US 270 sign should be a VA 270 sign. 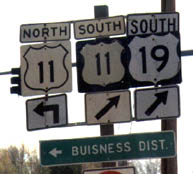 It's located in Russell County., Va., at St. Paul, on Alternate US 58 eastbound. The photo was taken in October 1997. UPDATE: As of April 1999, the goof had been repaired. This sign at Abingdon has "Business" misspelled.